Seacrest on Twitter: "Very excited about locking in a deal"
(CNN) -- There may be speculation about which judges will be returning to "American Idol" next season, but there's no question about one "Idol" regular: Host Ryan Seacrest is definitely back on board in a big way. 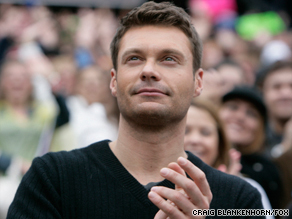 "American Idol" host Ryan Seacrest has reportedly signed a three-year, $45 million deal with the show. According to The Hollywood Reporter, Seacrest closed Monday on a deal with CKX, parent company of "Idol" producer 19 Entertainment, worth $45 million over three years. That figure reportedly triples the not-quite-$5 million annual salary he is said to have earned in the past for hosting the hit Fox music competition. A post on his Twitter page stated that Seacrest was "very excited about locking in a deal to host idol for this season and the following 2," which was quickly followed by a tweet that said, "Lots of conversations going on behind the scenes but I fully expect you will see the whole team next year." The lucrative contract further adds to Seacrest's empire, which includes a gig as a host of a popular syndicated radio show as well as duties for E! News and ABC's New Year's Eve special. Forbes ranked him No. 44 in the 2009 Celebrity 100 -- its annual list of the most powerful celebs -- and dubbed him "the hardest-working man in entertainment," with an estimated pay of $38 million. That payday included work developing and producing television shows like E's "Keeping Up With the Kardashians" as well as endorsement deals with Proctor & Gamble and Coca-Cola. The new deal reportedly granted CKX Seacrest's on-camera services for broadcast TV exclusively and is believed to be one of the most generous deals ever for a reality television host. The future is still unsure for judge Simon Cowell -- who has reportedly said he might leave the show when his contract is up at the end of next season -- and judge/songwriter Kara DioGuardi, who many questioned as an addition last season. Seacrest's Web site reported that the host addressed his deal on his radio show Monday and noted that he was "looking forward" to being back with his "Idol" family on Monday night in Denver, Colorado, where hopefuls were scheduled to audition for next season.